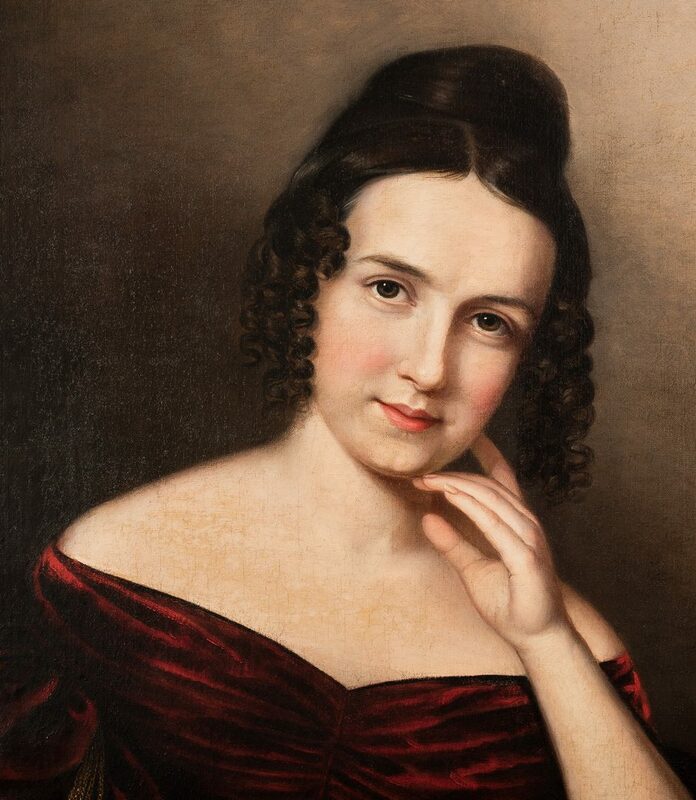 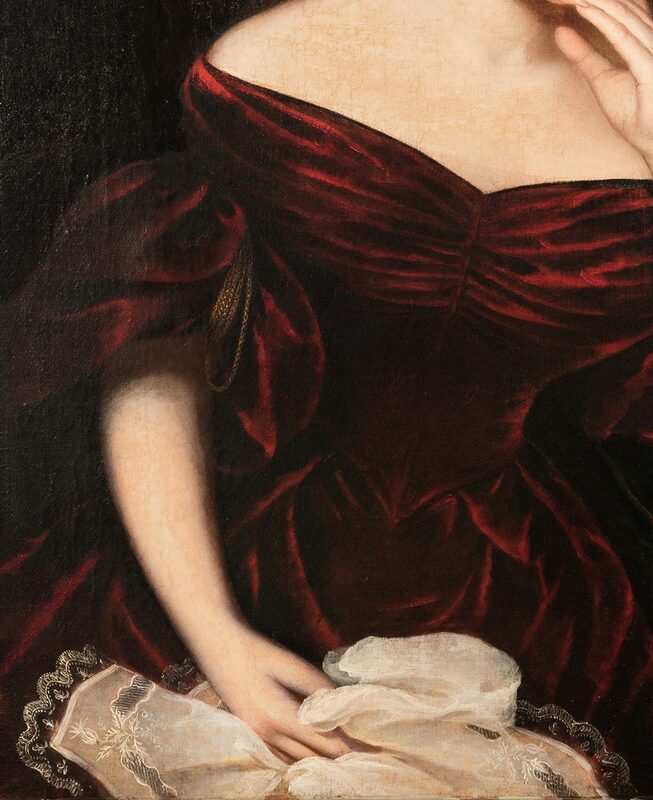 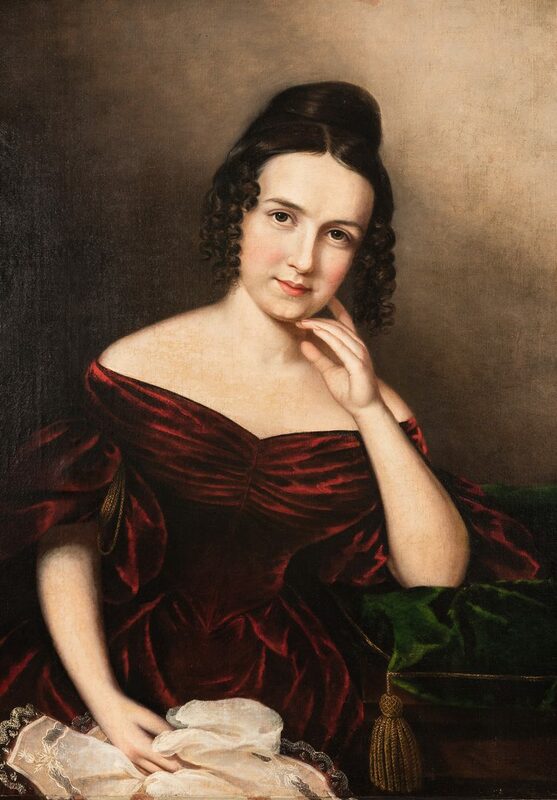 Attributed to Sarah Peale (American, 1800-1885), mid 19th century oil on canvas portrait of a young woman with dark hair, attired in an off shoulder burgundy velvet dress, seated with her left arm resting upon a green velvet cushion and her hand at her neck, her other hand holding a piece of white lace-trimmed cloth. 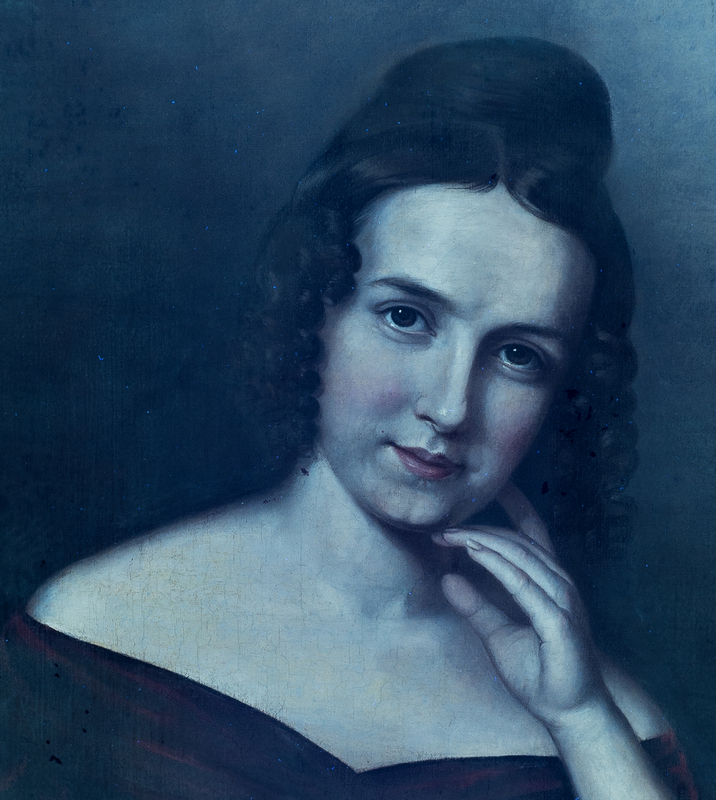 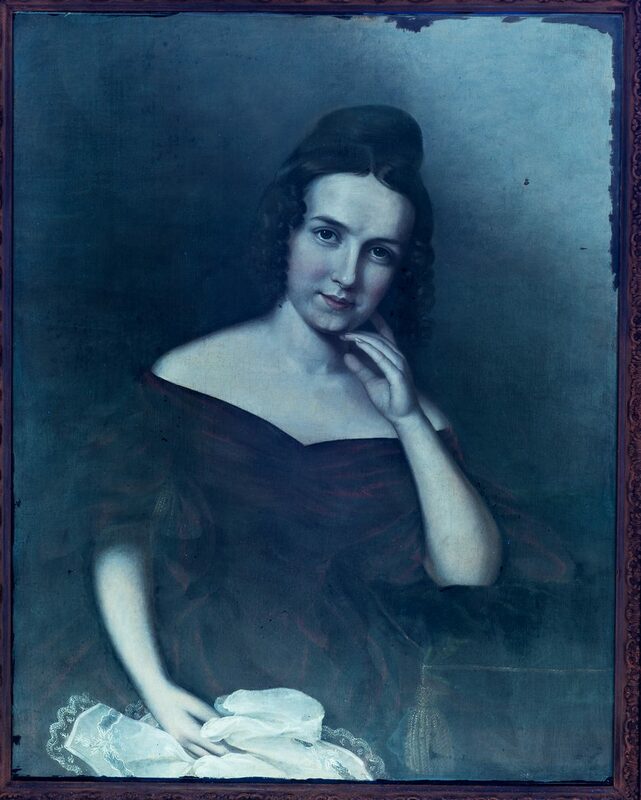 Sitter is possibly Sarah Beatty McKim Telfair McIlvaine of Baltimore (1815-1899). 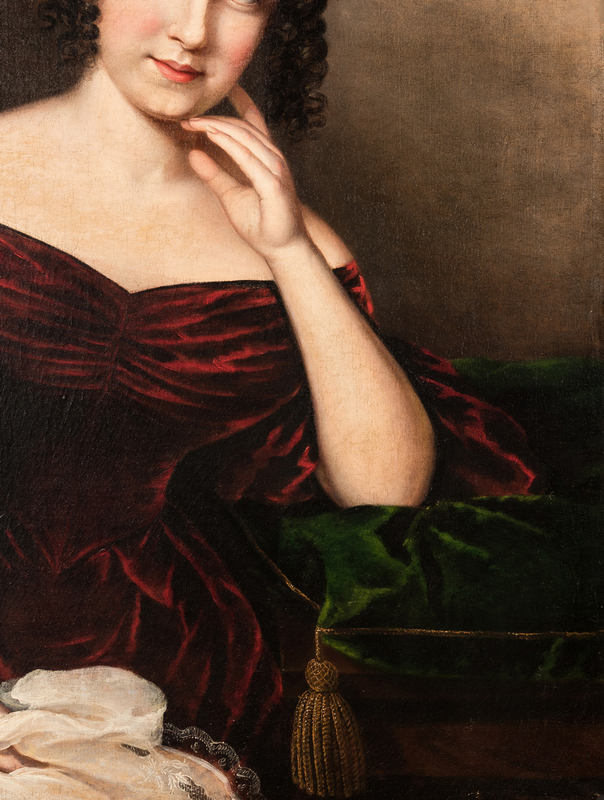 The McKim family commissioned work from Sarahs older cousin, Rembrandt Peale, during the teens and early 1820s when he was in Baltimore. 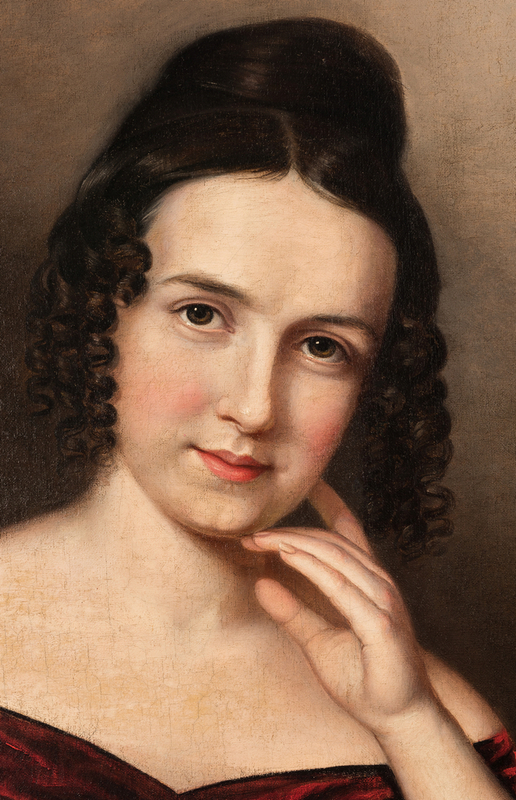 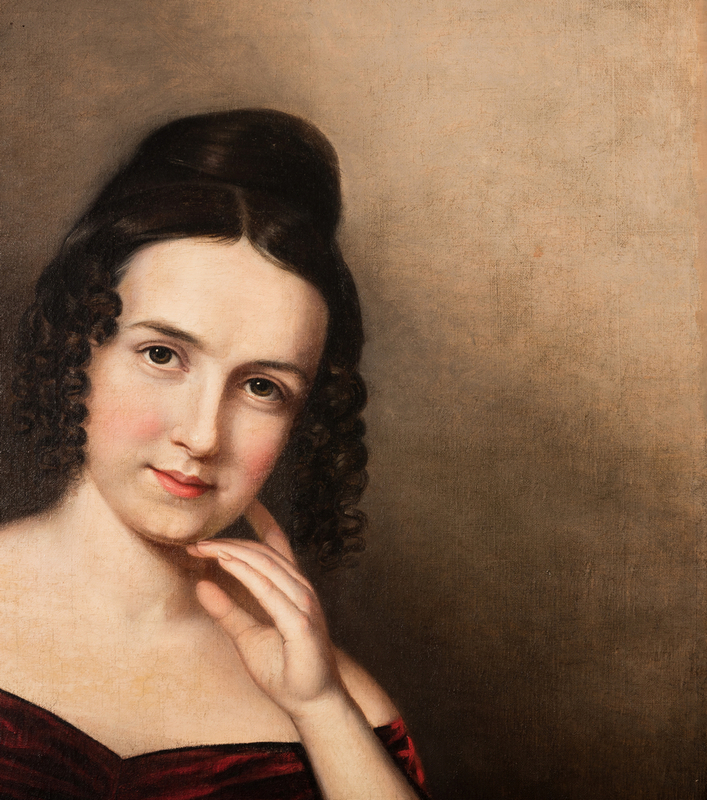 Some of his connections facilitated the career of Sarah, who also became a well-known painter in Baltimore. 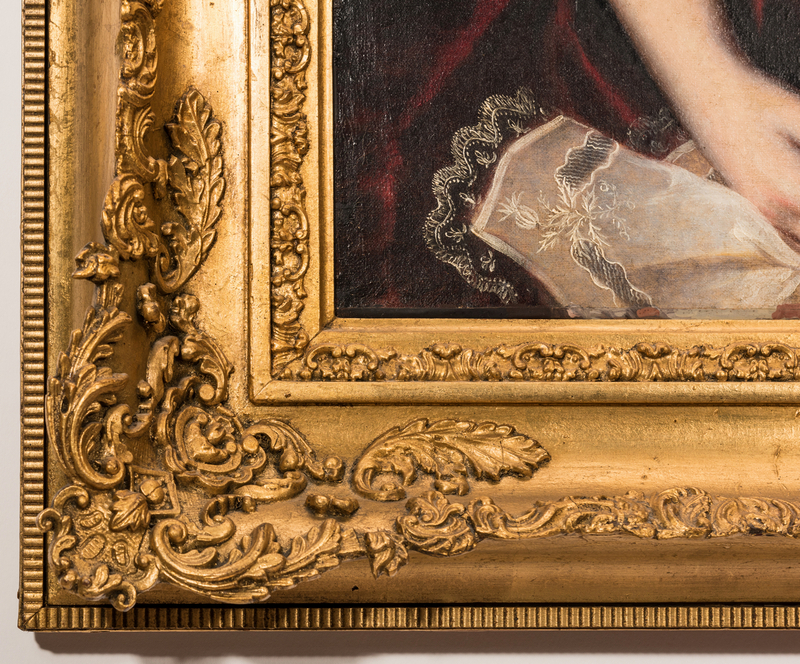 Housed in a Louis XIV style carved giltwood and composition frame. Unsigned. 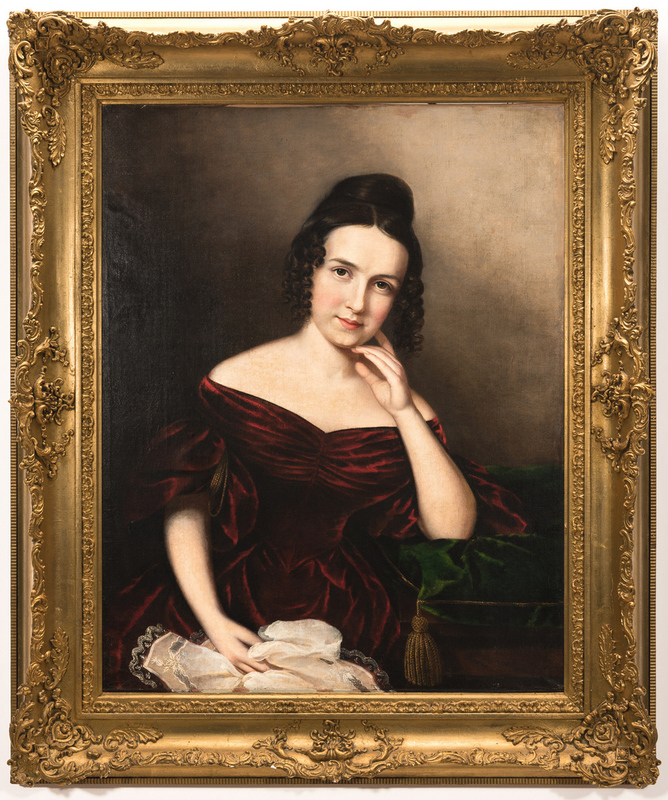 Sight 35 1/4" H x 27 1/4" W. Framed 46 1/4" H x 38 1/2" W. Provenance: Baltimore estates of Virginia Howard Miller (c. 1880-1946) and Hugh Purviance King (1873-1966) passed down to present Living Estate of Virginia Johnston, Chattanooga, TN. 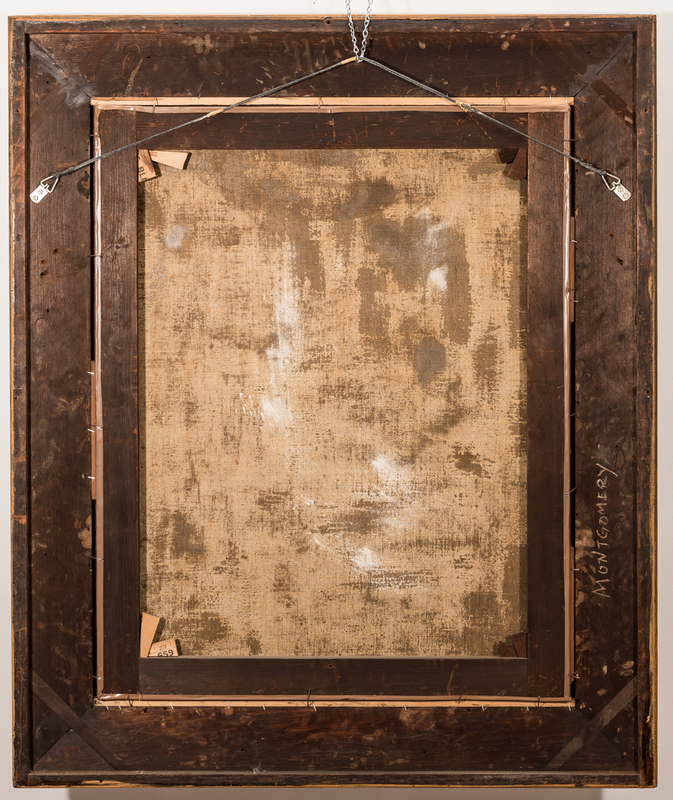 CONDITION: Good condition with light craquelure overall. 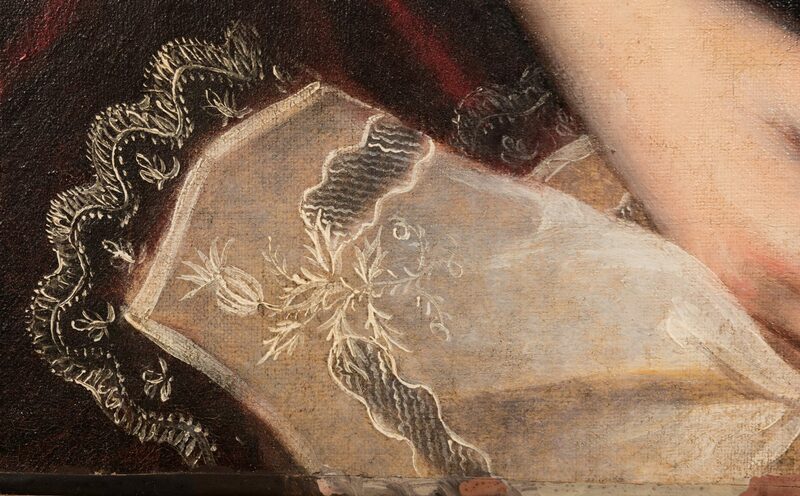 Restoration and inpainting to top right corner: 12" strip down right side and 11" strip across top (see black light photo). 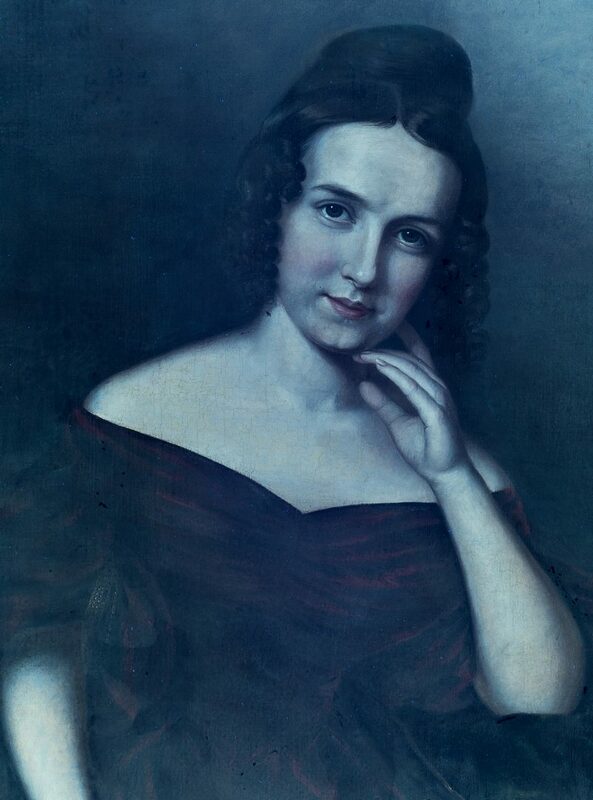 Minor scattered inpainting to right side of sitter's hair, and small area in bottom left corner. 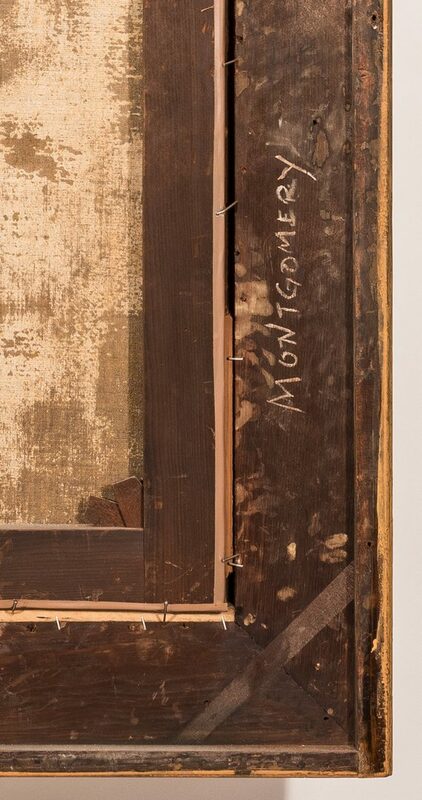 Relining possible with vinyl tape around canvas edges visible on front and back. Frame likely retro-fitted to fit painting.